Which way now – FTSE, Gilts, Sterling and the EU referendum? Last week the UK Prime Minister began to debate EU treaty reform with his European counterparts. He has a long way to go. The deadline for a UK referendum on EU membership is the end of 2017 but an up-hill battle is likely because all EU countries must ratify treaty changes – the referendum will come before EU treaty changes have been agreed. In this letter I will review the history of UKs, uncomfortable, membership of the EU and previous renegotiations, compared with today’s proposals. I will then go on to consider the implications for Sterling, Gilts and UK Stocks should the UK decide to stay or go. The last time the UK voted on EU, or as it was then called, European Economic Community (EEC) membership, was in 1975. At that time the “yes” vote won by 67.5%. This took place only two years after first joining, previous attempts to join in 1961 and 1967 having been vetoed by French President de Gaulle. British scepticism about the political ambitions of the Schuman declaration of May 1950 meant the UK failed to join the European Coal and Steel Community – established at the Treaty of Paris in 1951 – but spent much of the decade debating EEC membership. When the EEC was finally established in 1958, the UK opted out for two principal reasons: concern about its relationship with the Commonwealth and other international alliances, and its preference for free-trade over economic organisation and sectoral policies. At that time the UK was torn between two foreign policy strategies, one focused on the European Free Trade Area, the other on the General Agreement on Tariffs and Trades – the predecessor to the World Trade Organisation (WTO). The 1974 treaty renegotiation, just a year after joining the EEC, was driven by three factors: free-trade versus political integration, the effects of the collapse of Bretton Woods and subsequent inflation on the UK economy – Sterling had been considered a quasi-reserve currency up to this point – and the size of UK contributions to the EEC budget which the UK government considered to be excessive. The next major test of the UK relationship with the EU came during Margaret Thatcher’s first Conservative government (1979-1983) although an agreement with the EEC was not reached until her second term in 1984. On this occasion the issue was simply a question of how much the UK was paying in to the EU budget given that 80% of that budget was then spent on maintaining the Common Agricultural policy (CAP). The UK “rebate” was sanctioned because at that time the UK was the second poorest of the ten member EEC. On the latter point, this takes two principal forms: the ability to block EU legislation where it may be detrimental to UK interests and the ending of a commitment to “ever closer union” in respect of UK membership. 1.Freedom of movement for workers shall be secured within the Community by the end of the transitional period at the latest. 2. Such freedom of movement shall entail the abolition of any discrimination based on nationality between workers of the Member States as regards employment, remuneration and other conditions of work and employment. 3. It shall entail the right, subject to limitations justified on grounds of public policy, public security or public health: (a) to accept offers of employment actually made; (b) to move freely within the territory of Member States for this purpose; (c) to stay in a Member State for the purpose of employment in accordance with the provisions governing the employment of nationals of that State laid down by law, regulation or administrative action; (d) to remain in the territory of a Member State after having been employed in that State, subject to conditions which shall be embodied in implementing regulations to be drawn up by the Commission. 4. The provisions of this Article shall not apply to employment in the public service. This leaves, the reclaiming of powers from Brussels. “Ever closer union” is probably negotiable since EU member states have always moved at different rates, both economically and culturally. Allowing the UK to pick and choose which aspects of EU legislation it accepts, however, is like joining an exclusive club and then ignoring the rules. Under normal circumstances you’d be asked to leave. In the real world, there are finite limits beyond which it does not make sense to grow. Kohr argued that only small states can have true democracies, because only in small states can the citizen have some direct influence over the governing authorities. In the interests of levity I’ve included a link to this summation of UK foreign policy with regard to Europe from the satirical TV programme Yes, Minister – this episode was first aired in 1980. As a member of the European Union, our companies can sell, without barriers, to a market of 500 million people. The Single Market means that exporters only need to abide by one set of European regulations, instead of 28 national ones. Europe is our biggest trading partner- it buys 45% of our exports. If we left the EU, companies would face tariffs and regulatory barriers to trade. The free movement of capital means that EU companies can invest here in Britain freely. This investment, by companies like Siemens, creates jobs and grows our economy. 46% of all the foreign investment in Britain came from EU countries. The EU provides funding for businesses to all regions of Britain, particularly those with the greatest need. From 2014 until 2020, £8 billion of EU money will go from Brussels to the UK. The biggest winners from this process are Cornwall, Wales, the Scottish Highlands, Northern Ireland and the North of England. EU research funding helps universities and firms innovate to create the technologies of the future. Britain will receive £7 billion from the EU’s Horizon 2020 fund, and our small businesses receive more funding for hi-tech research than those of any other EU country. EU membership is vital to rebalancing the British economy. 1.Freedom to make stronger trade deals with other nations. 2. Freedom to spend UK resources presently through EU membership in the UK to the advantage of our citizens. 3. Freedom to control our national borders. 4. Freedom to restore Britain’s special legal system. 5. Freedom to deregulate the EU’s costly mass of laws. 6. Freedom to make major savings for British consumers. 7. Freedom to improve the British economy and generate more jobs. 8. Freedom to regenerate Britain’s fisheries. 9. Freedom to save the NHS from EU threats to undermine it by harmonising healthcare across the EU, and to reduce welfare payments to non-UK EU citizens. 10. Freedom to restore British customs and traditions. Britain would lose 3mln jobs if we left the EU – Under the terms of the Lisbon Treaty the UK would enter into an FTA with the EU. The WTO obliges them to do so too. Of more importance the UK trade balance will the EU is in increasing deficit – the other member states have more to lose. Britain will be excluded from trade with the EU by Tariff Barriers – EU has FTAs with 53 countries with a further 74 countries pending. In 2009 UK charged customs duty of just 1.76% on non-EU imports. The EU Common Market is basically redundant already. Britain cannot survive economically outside the EU in a world of trading blocs – Japan does and it’s not a member. The EU’s share of world GDP is forecast to be 15% in 2020, down from 26% in 1980. Norway and Switzerland export more, per capita, to the EU than the UK does. Britain’s best trading relationships are with the USA and Switzerland. The largest investor in the UK is US. The EU is moving towards the UK’s position on cutting regulation and bureaucracy – EU directives are subject to a ‘rachet’ effect – once in place they are unlikely to be reformed or repealed. 80% of the UK’s GDP is generated within the UK so should not be subject to EU laws. In 2010, Open Europe estimated EU regulation had cost Britain £124 billion since 1998. If we leave, Britain will have to pay billions to the EU and implement all its regulations without having a say – The UK has 8.4% of votes. The Lisbon Treaty ensured the loss of Britain’s veto in many more policy areas. Swiss Case Study: The Swiss pay the EU less than CHF600mln a year for access to the EU market. They estimate the cost of full membership would be CHF3.4bln. Norway Case Study: In 2009 Norway’s total financial contributions to the EEA (European Economic Area) agreement was Eur340mln Britain pays £18.4bln per annum. The EU has a positive impact on the British Economy – Fishing (115,000 jobs lost) farming, postal services and manufacturing have been devastated by EU membership. Unnecessary red tape, aid contributions, inflated consumer prices (due to CAP etc.) are indirect costs. Culture and values, English language, Telecommunications infrastructure, Quality of life, Stable social environment, Transport and logistics infrastructure. Britain will lose all influence in the world by being outside the EU – Britain has a substantial ‘portfolio of power’ including membership of the G20 and G8, a permanent seat on the UN Security Council and seats on the IMF and WTO. The British Commonwealth has 54 nations which is being discriminated against by EU policy. London is the financial capital of the world and Britain has the sixth largest economy. The UK is also in the top ten manufacturing nations in the world. Legally, Britain cannot leave the EU – A single clause Bill passed at Westminster can repeal the European Communities Act 1972 and its attendant Amendment Acts. Having dealt with the main arguments for remaining in the EU, Better off Out do point out that creating an FTA with the EU may take time. Greenland established a precedent when it left the EEC in 1985, this followed a referendum in 1982 and the signing of the Greenland Treaty in 1984. It had joined, as part of Denmark in 1973 but after it had achieved home rule in 1979 the importance of its fishing industry became a major economic incentive for it to leave the forerunner to the EU. An EU without Britain would be smaller, poorer, and less influential on the world stage. The UK makes up nearly 12.5 percent of the EU’s population, 14.8 percent of its economy, and 19.4 percent of its exports (excluding intra-EU trade). Furthermore, it runs a trade deficit of £28 billion, is home to around two million other EU citizens, and remains one of the largest net contributors to the EU budget (responsible for 12 percent of the budget in total). Meanwhile the Confederation of British Industry claim that being a member of the EU is worth £3,000 per household whilst Business for Britain estimate that the UK would save £933 per person from cheaper food if they left. In a report last week S&P chimed in, saying 30% of foreign direct investment (FDI) into the UK – representing 17% of GDP – was directed to financial services and insurance. 50% of this FDI emanated from other EU countries – this could be at risk if the UK should leave. So the debate rumbles on. How is the UK economy evolving? The UK is lying 6th out of the G7 in terms of output per hours worked, and since 2007, has underperformed the G7 average. The dotted line shows where productivity would have been had the recession not hit. The UK had been lagging its peers during the 1990’s so the predicted outperformance would merely have brought it back into the fold. Between 2000 and 2007, the average worker in the UK automotive manufacturing industry produced 7.7 vehicles a year. Over the past seven years he/she averaged 9.8 vehicles a year. Productivity – output per worker – in car manufacturing has increased by 30% since the onset of the great financial crisis. Britain has become the fourth-biggest vehicle maker in the EU and is more efficient than bigger producers such as Germany and France. … Unfortunately productivity in the UK has not followed the lead of the car industry. Indeed, the opposite is true. 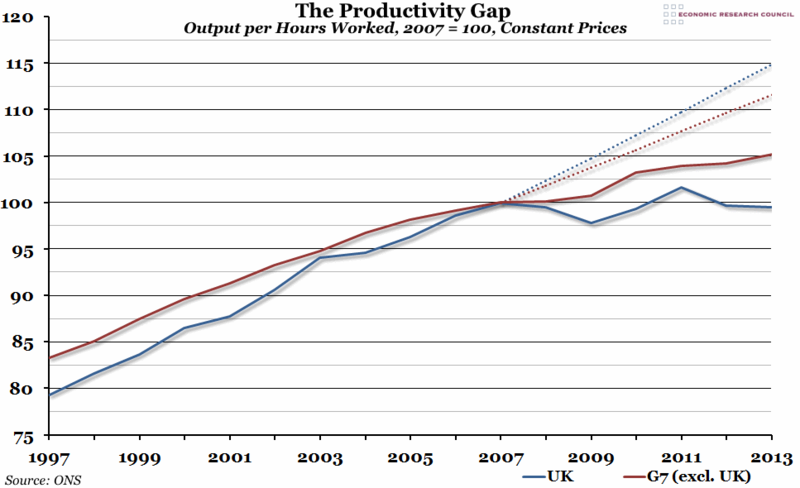 In 2014 labour productivity in the UK was actually slightly lower than its 2007 level. In the seven years between 2000 and 2007 labour productivity grew at an average annual rate of about 2% a year. In the seven years that followed, our annual productivity growth averaged just below zero. Or to look at it another way, the level of labour productivity – output per hour worked – in the UK economy is now 15% below where it would have been if pre-crisis trends had continued. …It is true that the average output per hour of the rest of the G7 advanced economies is only around 5% above its pre-crisis level. But as I have noted, in the UK it has not even recovered to that level. And in 2013 output per hour in the UK was 17 percentage points below the average for the rest of the G7 – the widest gap since 1992. …In the 10 years prior to the crisis, growth in the hours worked in the UK economy, accounted for 23% of the UK’s overall economic growth. The mainstay of our economic growth, the other 77%, came from growth in productivity. Since 2013 only 9% of our annual economic growth has come from productivity improvement. The remaining 91% has come from the increase in the total hours worked. As a result, employment in the UK is now around its highest rate since comparable records began in 1971. Over 73% of people aged 16-64 are working. There are now over 31 million people in work in the UK. Unemployment has fallen at among its fastest rate for 40 years and is now very close to its pre-crisis level – over the past two years over 1 million jobs have been created. … Productivity growth can be divided into two sorts of change: the change in productivity inside individual firms and the changes between firms. The first, the changes within firms, happens as firms increase their efficiency. The second happens as labour and capital are reallocated between firms, from the less productive ones to the more productive. … After collapsing in the crisis, productivity began to increase again within firms two years ago. We expect that to continue. As the economy grows, spare capacity is used up. The real cost of labour increases relative to the cost of investment. Firms have a greater incentive to find efficiency gains and to switch away from more labour-intensive forms of production. This should boost productivity. In contrast, productivity growth due to the reallocation of resources in the economy remains weak. We can see this in the divergence of rates of returns across firms which remain remarkably and unusually high and the change in capital across sectors which has been particularly low. When the reallocation mechanism is working, the transfer of capital and labour from the less productive to the more productive pulls up the level of productivity in the economy and reduces the divergence between firms. The high degree of divergence between firms at present implies that this reallocation mechanism is working significantly less powerfully now than before the crisis. This can also be seen in the proportion of loss-making firms which stands at around 20% higher than its long-run average. Company liquidations also remain low. So there is still more than a hint of ‘zombiness’ in the corporate sector. For more on productivity issue this working paper BoE – The UK productivity puzzle 2008–13: evidence from British businesses is full of interesting insights. The UK service sector continues to grow, although its share of exports to the EU remains smaller than that of goods – 37% vs 49%. Services exports to the rest of the world are the driver of UK export growth. 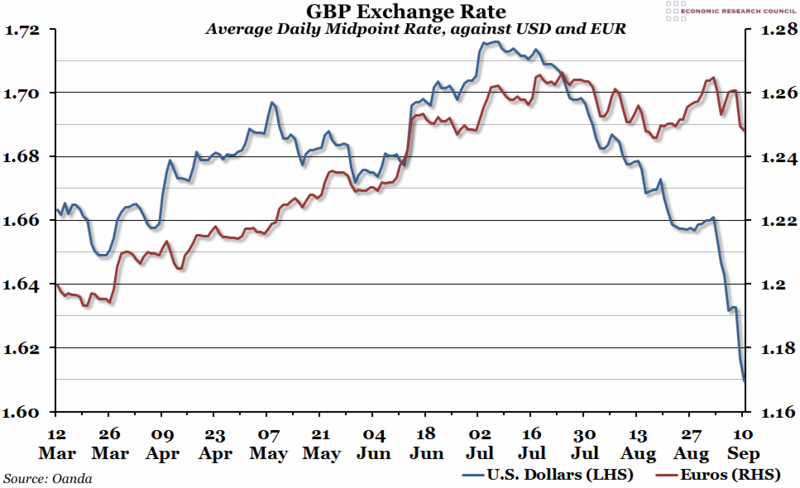 Should the population of the UK vote to forsake the EU, the relative stability of the GBPEUR exchange rate is likely to become structurally more volatile, the move against the USD from 1.72 to 1.61 is but a foretaste of what we should anticipate. 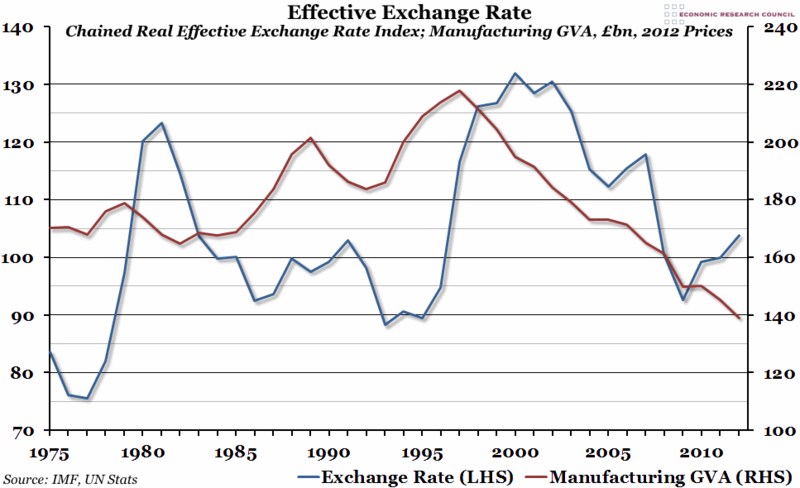 However, the 40% appreciation in the UK effective exchange rate between 1995 and 2000 – see the earlier chart above – and reversal between 2000 and 2009, suggests that membership of the EU has not led to the stability in exchange rates one might have expected. Germany was struggling during this period and the Hartz labour market reforms occurred shortly thereafter. 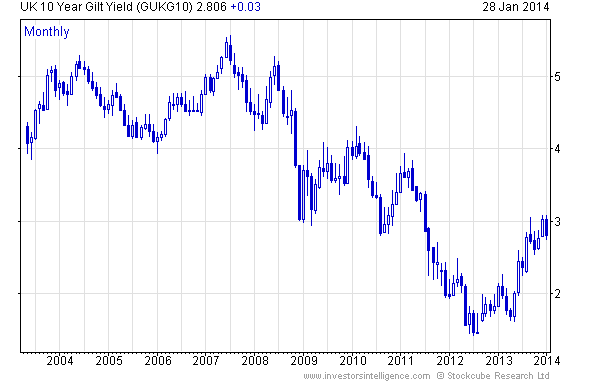 As the chart above shows UK Gilts have traded at a higher yield than German Bunds for most of last 25 years. I think it would be reasonable to assume Gilt yields, had the UK remained in the ERM and joined the Euro, would have been between those of Germany and France during this period. In other words, the cost of UK government financing has been around 150bp higher than it might have achieved had it joined the EZ. Germany appears to be something of an exception, France, Italy and the Netherlands have underperformed the UK during the same period: although Spain has delivered German-like returns. It is worth mentioning that Germany has run a balance of trade surplus for the entire period 1990 – 2015 whilst, excepting a brief period between 1991 and 1997, the UK has run a continuous trade deficit. I don’t believe UK membership of the EU has much influence over the value of UK stocks in aggregate. Certain companies benefit from access to Europe, others are disadvantaged. Ahead of the referendum, uncertainty will lead to weakness in Sterling, higher Gilt yields and relative underperformance of UK stocks. If the UK electorate decide to remain in the EU there will be a relief rally before long-term trends resume. If the UK leaves the EU, Sterling will fall, inflation will rise, Gilt yields will rise in response and the FTSE will decline. 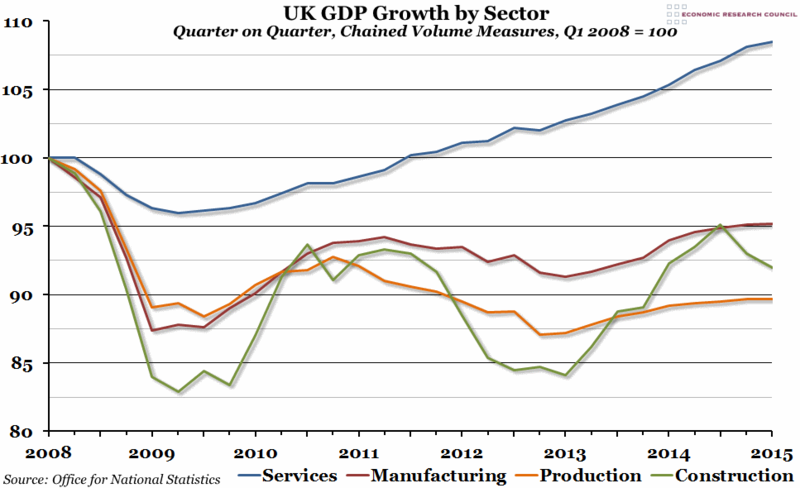 GDP growth will slow somewhat, until an export led recovery kicks in as a result of the lower value of Sterling. The real cost to the UK is in policy uncertainty. Longer term the demographic divergence between the UK and other countries of Europe will become evident. By 2060 the working age population of the UK is projected to increase from 37.8mln (2013) to 41.8mln whilst in Germany the same population will decline from 49.7mln to 35.4mln. The EC – Ageing Report 2015 – has more details. The UK can benefit from staying in the EU and continuously negotiating. However, it must become much more involved in the future of the EU project, including “ever closer union”. It can also benefit from “Brexit”, directly flattering the government’s bottom line. The worst of both worlds is to remain, as the UK has since 1950, sitting on the fence –decisiveness is good for financial markets and the wider economy. Whither the UK – From Tantalus to Sisyphus? It has been a long time since I have reviewed the UK economy and the prospects for our financial markets but the recent spate of positive economic news deserves investigation. 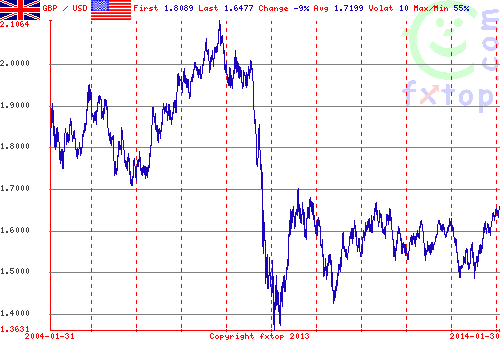 To begin I have enclosed a chart of GBP/USD. You will notice that despite a significant strengthening of GBP, in line with the improving economic data, we still have a distance to travel before returning to the pre-Northern Rock range. The near-term trend looks clear but a comprehensive break above 1.70 is required for confirmation. Of course short and long term interest rates have declined in most countries since the Great Recession but traditionally GBP was a “carry-currency” due to our structurally higher inflation rates. The “sea-change” in interest rate differentials has seen the “carry-trader” depart this sceptre isle. There are a number of other factors including the arrival of a coalition government in 2010, a significant decline in the UK housing market and a collapse in the UK export sector, despite the precipitous decline of sterling against its trading partners. Financial services went out of fashion and North Sea oil and gas production took an unfortunate nose-dived simultaneously. Looking at the chart of 10 year Gilt yields above, you will notice that yields bottomed in mid-2012 whilst GBP/USD took until 2013 to begin its recovery. The external factor driving Gilt yields to their nadir was the Eurozone crisis, however, since Draghi’s “whatever it takes” speech (July 26th 2012) Gilt yields have begun to normalise in a similar manner to the US. Meanwhile Eurozone rates have converged lower and German 10 year Bund rates have remained relatively low. Looking ahead it is not unreasonable to expect Gilt yields to go higher, but, with GBP rising and inflation falling this is likely to be a gradual process; added to which the Bank of England (BoE) have been softening their tone on prospective interest rate increases. The final and more general point is to caution against inferring too much about future growth from its current composition. Of course there’s a risk the recovery could falter. But, if it does, it will probably be because of more fundamental problems – a failure of productivity to respond to stronger demand, for example, or continuing stagnation in the euro area – not any imbalance in expenditure or income per se. These are outcomes, not determinants, of the economic cycle. As we shall see, they are poor predictors of future growth. …the MPC sees no immediate need to increase interest rates, even if unemployment reaches 7% in the near future. McCafferty goes on to discuss capital expenditure which, along with productivity growth, has been weak during the early stages of the recovery. We are very conscious that the headwinds have not gone away: much of Europe and some other parts of the world continue to struggle for sustained growth; fiscal consolidation in the UK (and elsewhere) is likely to continue for a while to come; and the financial sector still needs some rebuilding. Indeed, the official production and construction data released earlier this month were rather disappointing, reminding us that strong growth from here on is by no means guaranteed. Fisher goes on to explain that unemployment, and the composition of employment, are key metrics in their thought process. The whole speech is also a fascinating insight into the MPCs approach and their ideas on forward guidance. After the Great Moderation and the Great Recession, there are several reasons why it will be years before any superlatives are attached to this recovery. First, for all the talk of austerity and deleveraging, the aggregate debt burdens of advanced economies have actually increased; with their total non-financial sector debt rising by 25% relative to GDP since 2007. Balance sheet repair in the public and private sectors will exert a persistent drag on major economies for some time. Second, the need to rebalance demand from deficit to surplus countries endures. Given the adjustment pressures on the former, without progress on rebalancing, robust and sustainable global growth will remain an aspiration. Third, confidence, while improved, remains subdued. Recognising that the end isn’t nigh is far from marking the normalisation of business and consumer sentiment. Given past shocks and modest prospects, business investment in particular remains hesitant across the advanced world. On balance, corporations remain more focused on reducing operating expenditures than increasing capital expenditures. … Nevertheless, it appears that the recovery will need to be sustained for a period before productivity gains can resume in earnest. The latest data show that more than a quarter of a million jobs were created in a three-month period – the biggest increase since records began in 1971. As a result, unemployment seems to be falling at a pace that will reach our 7% threshold materially earlier than we had expected. Crucially, unemployment remains above the level that is likely to be consistent with maintaining inflation at the target in the medium term. It is not just that nearly three quarters of a million more people are out of work than before the crisis; another three quarters of a million more people are involuntarily working part time. The effect of this slack in the labour market is evident in wage inflation, which is at around 1% so that, even with weak productivity, unit labour cost growth remains below 2%. All of these comments concerning lack of productivity growth, elevated levels of unemployment, growth of part-time employment, lack of capital expenditure and international headwinds from the Eurozone, suggest that interest rates will stay low and the BoE will risk above target inflation to insure the economic recovery broadens and deepens. In this environment I see Gilts remaining in a relatively narrow range, even if inflation ticks higher once more. He attempted to be deliberately non-political – to judge by the press comment afterwards he failed – but it is a timely reminder that Scotland will vote on whether they remain in the Union on 18th September. The uncertainty surrounding the possible break-up of the Union and one what economic terms is another factor which will temper a broader based recovery. Other political clouds on the horizon include the European Parliament elections (22nd to 25th May) where nationalist parties are expected to gain significant ground. The FTSE100 has performed strongly since the beginning of 2013, in line with other developed country stock markets. The large dose of QE delivered by the BoE has underpinned this trend, but, now that the economy has regained some upward momentum, many commentators are becoming doubtful about the prospects for UK stocks – after all, lower interest rates are one of the most powerful drivers of equity market performance. China has announced a rebalancing of their economy towards domestic consumption, even if this is at the expense of headline GDP growth. This makes inward foreign investment into China less attractive – I expect capital to flow back to UK and USA. Japan is attempting to deliver economic growth through what PM Abe has dubbed the “Three Arrows” policy, this has already seen a significant decline in the JPY and a new “quasi-carry trade” is being driven but expectation of relative government spending. The US has begun to taper (another $10bln just this week) and the UK might follow suit at some point this year, but Japan will continue with QE. Emerging markets have already started to react to the changed policy of the Federal Reserve: India, beginning last year, Argentina, South Africa and Turkey, have seen their currencies depreciate and respond with higher interest rates since the start of the year. Emerging market bonds have, needless the say, fallen sharply, prompting international investors to liquidate some of their investments. The reversal of more than a decade of Capital flows to emerging markets will support developed country currencies, especially those, like the UK, with Capital account surpluses. Secondly, UK Exports have remained resilient despite the strengthening of sterling. I have some caveats concerning UK equities however; banking and financial services firms are still under pressure due to regulatory change – a new report from United Nations Conference on Trade and Development (UNCAD) shows the UK falling to second place behind the USA; down more than 20% from its peak only seven years ago. The European Commission has just announced plans to stop all proprietary trading by Banks by 2017 – whilst this is likely to be challenged by UK, France and Germany it will lead to the postponement of any expansion plans in this area. Another sector which is under pressure is mining or commodity firms which are still suffering from the downturn in prices in 2013 – this tallies with my short-term concerns about emerging markets. A number of commentators have suggested that the recent strength of the UK economy has been largely driven by increased debt, especially mortgages. Government schemes such as “funding for lending” actively encouraged UK banks to lend more aggressively despite their balance sheet constraints. 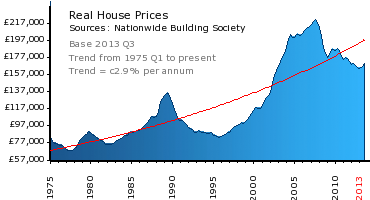 That problem with using monetary policy to stabilise the housing market would be acute if housing markets were overheating when the wider economy was not and consumer price inflation was low even though house price inflation was high. 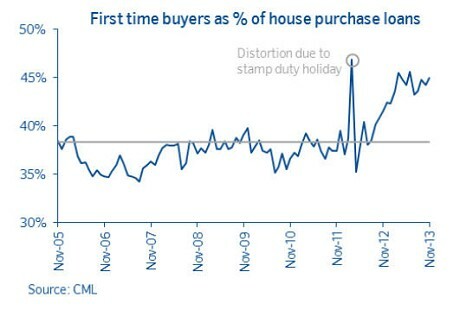 …High leverage is at the heart of problems in housing market. Monetary policy and macro prudential policy can influence leverage. But more fundamentally, use of outside equity might be a way of permanently bringing down reliance upon debt financing. In other words the BoE is unlikely to be concerned about house price inflation and will use macroprudential measures rather than interest rates to stem its rise should it occur in isolation. This is clearly good for property but, in anticipation of the “Macroprudential Stick” other asset classes, such as equities, may benefit by association. The author uses the Nationwide House Price Index, the BoE base rate plus 2% and the ONS after-tax income data. Almost everything I’ve written so far has been positive for the UK economy and neutral or positive for UK markets. After unprecedented actions by the BoE, the “Tantalus Phase” appears to be over; growth that was just out of reach is now within our grasp, however, ahead of us lies the “Sisyphus Phase” where we have to pay the piper. Since March 2009 Britain’s monetary base, also known as narrow money or M0, has increased by 321%. We can see that the majority of this is in the form of increased bank reserves, up 642% since March 2009. This is just what we’d expect to see following the Bank of England’s Quantitative Easing, where the Bank creates new money and uses it to purchase bonds from banks – that new money becomes bank reserves. Those banks have sat on that money (not using it as a basis for new credit creation and feeding into M4) which is why, while narrow (M0) money has exploded, broad (M4) money has barely budged, increasing by just 7.4% since March 2009. 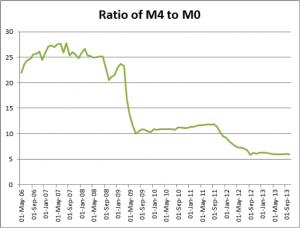 This relative restraint in M4 growth explains the relative restraint in inflation. There is no great mystery as to why banks which have just seen their assets tank and ravage their balance sheets should want to hold more reserves. The key question is what happens next. The flow of credit in the UK economy may be close to turning a corner in connection with recent improvements in the macroeconomic outturns and outlook, and as banks finish adapting to a new regulatory environment. Improving access to finance for firms and SMEs is set to remain a crucial element for driving the desirable rebalancing of the UK economy, fomenting investment and fostering the reallocation of resources to the most productive sectors of the economy throughout the on-going recovery. Overall credit availability to the corporate sector was reported to have increased significantly in 2013 Q4; lenders have now reported an increase in availability for five consecutive quarters. Lenders cited market share objectives, competition from capital markets and an improvement in the economic outlook as factors that had contributed significantly to the increase in availability. All these factors were expected to contribute significantly to availability in 2014 Q1. 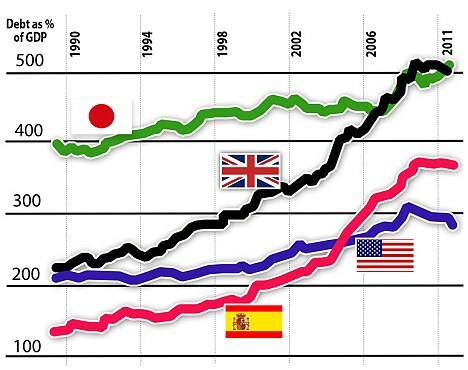 Against this back-drop of improving conditions, however, it is important to realise that the combination of UK public and private sector debt is the second largest of any developed country on the planet relative to GDP – only Japan carries a greater burden. Academic research has shown that when the ratio of debt to GDP exceeds 260% to 275% this tends to act as a drag on economic growth. The chart below is from 2012 but the situation has not improved. UK Household debt is now at a record £1.43trln, although, it has fallen from 167% of income to 140% since 2008. At some point in the future we will have a “reckoning” – probably when broad-based inflation begins to rise once more. 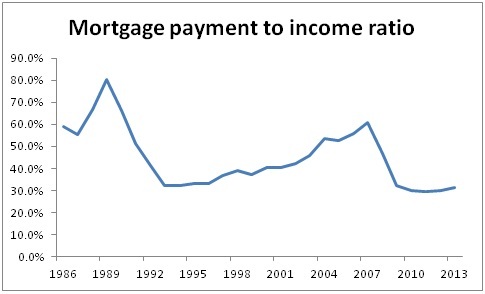 Interest rates will rise dramatically to control credit growth. What the catalyst will be is difficult to say – a breakup of the Eurozone could lead to a collapse of GBP, the next major leg of a commodity super-cycle turbo-charged by the collapse of the Saudi regime – it’s best not to speculate, but, perhaps the longer term factor most likely to re-ignite the inflationary potential of the “great debasement” is demographic. As the “Baby-boomers” finish retiring and downsizing the next leg of the demographic cycle will begin, with increased spending and consumption. When these “new-boomers” eclipse the “old-boomers” inflation will regain its power to decimate the value of money whilst at the same time asset prices will collapse under a deluge of foreclosures and debt default. The Sisyphian task will be to reduce the debt against the rising tide of servicing costs. But when will the next “Baby Boom” arrive? According to ONS data, UK population growth to mid-2011 was the highest in 40 years. They predict that, should this trend continue, the UK will have the largest population of any country in Europe by 2050. Recent CML data shows the average age of first time house buyers to be 29/30 years. I therefore anticipate a “mini-baby boom” effect kicking in between 2015 and 2020, followed by a 10 year decline. From 2030 this pattern will reverse; by 2040 the next significant inflation wave will be in full swing. My expectation is that during the remainder of this decade demographic forces will be somewhat supportive of inflation but attempts to deleverage UK debt after 2020 will have more deflationary consequences. Sterling looks well placed to move back into its pre-crisis range. Gilts are caught between inflationary and deflationary forces and should remain range-bound. UK Equities are likely to benefit from inward capital flows and UK property looks better than ever – barring a significant change in UK planning laws, this is my preferred UK asset class for 2014, and probably beyond.